First and foremost, we use high quality, organic buckwheat hulls in our organic buckwheat pillows. 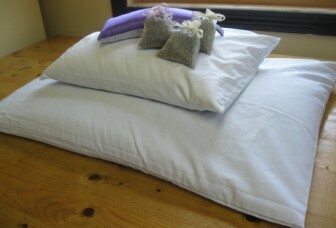 We are determined to use only the finest material when making our organic buckwheat hull pillows. Unlike some of our competitors, our organic buckwheat hulls are non-fumigated and are the finest available on the market. After extensive research, we found an old, established company that specializes in organic buckwheat. We provide a hint of lavender or balsam aromatherapy if desired. You may also choose to receive the aromatherapy mix-in “on the side” so you may use the amount you prefer. We have had NO cases of any allergic reaction to buckwheat hulls ever reported for our L-OMA buckwheat pillow™. You may hear an organic buckwheat pillow referred to as: organic buckwheat pillow, organic buckwheat hull pillow, organic buckwheat husk pillows, husk pillows, or even by our company brand name L-OMA organic buckwheat pillow™. Regardless of what you call it, they’re all the same type of pillow. However, not all organic buckwheat pillows are created equal. Some manufacturers do not use the highest quality organic buckwheat hulls in their pillows. Our intention is to provide our customers with a very comfortable, quality organic buckwheat pillow and we have numerous testimonials throughout the years of all of the many benefits they have provided. Do your friends a favor and tell them how much you enjoy your L-OMA organic buckwheat pillow™.